For a recent cooking class, my tutee wanted to make rum cake. I don’t have rum cake in my repertoire, and although there are several fortified Nicaraguan desserts and rum is like mother’s milk to the populace, I couldn’t find one in the infamous Nica Joy of Cooking, Doña Angélica. My mom suggested I use our household orange bundt as a base and replace some of the milk with rum. A sensible suggestion, but I Googled “rum cake” anyway. Boxed yellow cake + rum. Not quite the avenue I’d planned on taking. I like secrets! And I also like that this recipe had 3 sticks of butter plus 1 cup of heavy cream. I added a few spices to the recipe and, deciding that ¾ cup rum in the cake was stingy (mother’s milk, remember? ), made a buttery-burnt sugar-orange-rum glaze. This cake is incredibly moist and stays that way for about a week. Love it. Love it. Love it. 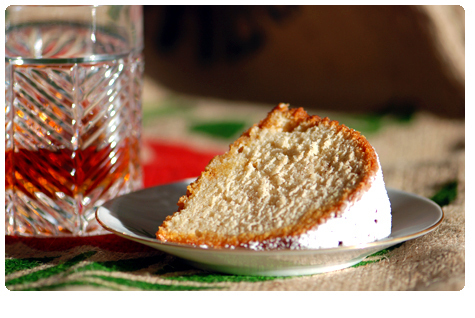 I recommend a 7 or 12-year-old Flor de Caña (Nicaraguan rum) for this cake. If you can’t get Flor, substitute with dark rum of your liking. For an extra burst of orange flavor, process the sugar and orange zest in a food processor for about 1 minute. Prepare the glaze while the cake is in the oven. It’s best to use a stainless steel saucepan for this recipe—a dark pan will make it difficult to determine the caramel’s color and progress. Avoid a shallow pan as there will be sputtering. ¡Atención! The base of this glaze is caramel, just like the one on flan. Please be careful when working with hot sugar—it’s like liquid napalm and you should never be tempted to stick your finger in the pot to have a taste. Unless you’re looking to erase the friction ridges on your fingertips. – Position a rack in the middle of the oven and preheat it to 350˚F. Butter and flour (or spray with Pam for Baking) a Bundt pan. – Sift together the flour, baking powder, baking soda, cinnamon, ginger, allspice, and salt; set aside. Combine the cream and rum in a liquid measuring cup; set aside. – With an electric mixer (use the paddle attachment if using standing mixer) on medium speed, beat the butter, sugar, and zest until light and fluffy, about 3 minutes. Add the egg yolk and beat until fully incorporated. Add the whole eggs, one at a time, beating well after each addition. Add the vanilla and reduce speed to low. Add the flour mixture in 3 additions, alternating with the cream-rum mixture, stopping once or twice to scrape the sides and bottom of bowl with a rubber spatula. Mix until smooth, about 1 minute. – Pour the batter into the prepared Bundt pan and bake until a toothpick inserted into the cake comes out clean, about 1 hour. – Combine the rum and orange juice in a liquid measuring cup; set aside. – Place the sugar and water in a heavy bottomed, stainless steel, medium saucepan. Bring the mixture to a boil over medium-high heat and cook, gently swirling the saucepan from time to time, until the sugar turns deep amber and begins to smoke, 10 to 12 minutes. – Immediately remove the saucepan from heat, and slowly and carefully pour in the rum-orange juice mixture. The mixture will sputter quite violently—don’t move the saucepan or stir the mixture. Once the sputtering has subsided, return the saucepan to medium heat, and with a heat-proof rubber spatula, stir until smooth, about 3 minutes. Stir in the butter and salt. Reserve ½ cup of the glaze. – Once the cake is out of the oven, poke it all over with a metal or wooden skewer. Pour the remaining glaze over the cake and allow it to sit in the pan for 20 minutes before turning out onto a cooling rack. Brush the cake with the reserved glaze and cool completely before serving. Easter was a casual affair, with some simple but decadent food. A friend brought over a tin of duck confit (thank you very much!) which was promptly shredded and crisped and served alongside potatoes sautéed in a ladleful of duck fat, then topped it with runny-yolked fried eggs. It was salty, crisp, starchy happiness. The salad, the mesclun greens with grapefruit suprêmes, shaved endive, and paper-thin pear slices, lightened the meal a bit, but I still think all that richness gave me a touch of gout.